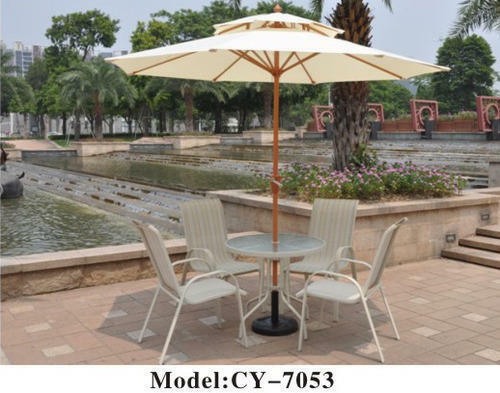 Backed by rich industry experience and market understanding, we are involved in offering a wide array of Designer Wooden Garden Umbrella to our valued patrons. Incepted in the year 2005, at Noida (Uttar Pradesh, India), we, “Home Design”, are the well-established manufacturer, trader and supplier of a wide assortment of Office Furniture, Outdoor Furniture, Restaurant Furniture, Hotel House Furniture, Home Furniture, Modular Furniture, Steel Furniture, etc. The offered range is fabricated by our creative designers and architects that have immense expertise in this domain and possess years of industry experience. Designed and developed using premium quality steel and with the help of advance techniques, our offered range is widely used in homes, offices, hotels and other related establishment. These products are widely acknowledged among clients for their termite resistance, durable finish, fine polish, exquisite design and attractive look & extensively acclaimed for providing high level comfort and for enhancing the décor of place. We also provide Interior Solution to our clients.